The Alpine reverse flow project will create 40mcm/day of gas export capacity from Italy, a market that has traditionally been an importer only. Italy usually takes its price from northwest European hubs – its marginal source of gas – plus transport costs. The project has EU backing. The Italian authorities want to see the country become a crossroad for gas in the region, but Italian exports will depend on future price differentials between markets and the evolution of Italy’s long-term supply mix. 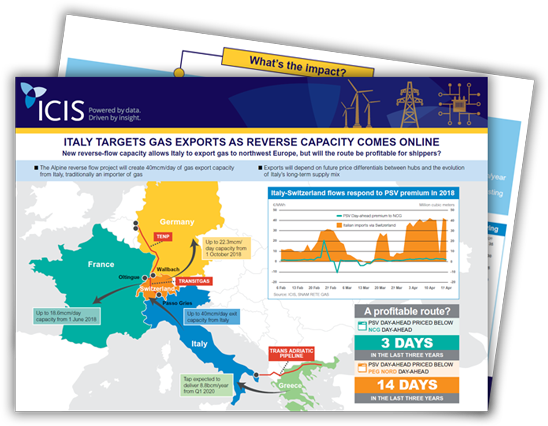 In this infographic, taken from the Gas In Focus report, ICIS explains the significance of this project for the European market in both short and longterm. Download a free copy now and also get access to a video featuring Gas In Focus Editor Katya Zapletnyuk, Deputy Editor Emma Slawinski and Senior Market Reporter, Alice Casagni.